The Dunsfold underground structure was constructed as a result of the Royal Observer Corps (ROC) nuclear reporting role during the Cold War between 1961 and 1991. 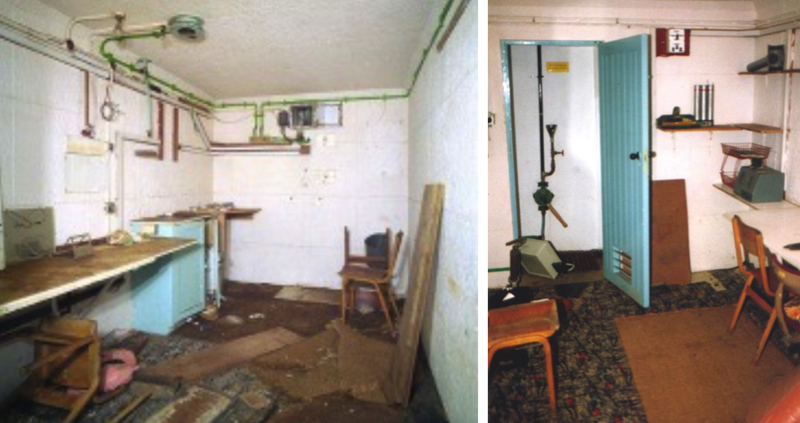 It was built to a standard design consisting of a 14” deep access shaft, monitoring room and a toilet/store. The first post had been on Cranleigh Common before the construction of this subterranean chamber known as 52 Dunsfold (TQ01823580) which reported to the headquarters at Horsham (TQ17882979). The Royal Observer Corps (ROC) was a civilian defence organisation operated by mainly civilian volunteers. The first prototype post was built at Farnham, Surrey in 1956. The final trials were conducted on the usefulness of the underground posts by the end of September. There were to be two crews of four personnel for staffing these posts; at Farnham they trailed 2 ROC and 2 Home Office Scientific Advisory Branch. They were sealed inside with rations and sleeping arrangements. A few changes included amendments to the hatch and air ventilation louvres. The Dunsfold ROC Post was Grade II Listed by Historic England in 2017. ROC Post Dunsfold – archive photo prior to closure. I WAS A MEMBER OF THE ROYAL OBSERVER CORPS NO.1 GROUP MAIDSTONE FOR ABOUT 14 YEARS I DID RECIEVE A MEDAL FOR DOING THAT NUMBER OF SERVICES FROM TED GREEN THE CORP COMMANDANT.I HAVE LOST IT.I WOULD LIKE ANOTHER ONE IF POSSIBLE.I WILL SEND THE MONEY ON AS SOON AS I KNOW HOW MUCH IT IS.MY ADDRESS IS 4.SHERWOOD TRUST HOMES ST.MICHAELS STREET FOLKESTONE KENT CT201LN.